First and foremost: READ, understand what you're getting into. NEXT: Prepare a suitable habitat. THEN: Do what you can to secure an initially healthy specimen. AND: quarantine it for a good two weeks for observation, hardening, acclimating it to foods/feeding, assuring it's healthy. Hope all is well in your world. One of my large anemones exhibited some odd behavior...thought you may have some ideas on it. Please see attached pictures. <Yeah; have seen this sort of expression on occasion; and heard/read various theories advanced as cause/s. I urge the usual checking re water quality issues, perhaps a double/triple dosing (one time) of iodide, the addition of a few grams of simple sugar (glucose best) and nothing else. In most all cases this "bubbliness" solves itself in days to a couple weeks. Hey guys how has it been. amount of why looks like green brown stringy material almost like a small hay. They are still solid feeling when introduced to the system. Could they have an issue with the substrate ? We acclimate them with :30 float and :30 drip. Have kicked around putting them in a bare bottom and doing water changes ever hour till they quit expelling that material. The nems all looked in tack in the bags and were shipped 5 per med sized bag. Do appear dyed eh? Color loss from simple dilution/division? Anemone Dead and Dying Days Follow-up >Marina, >>Karol.. >Inventory of livestock is as follows: 1 neon Dottyback (tank raised) 1 canary wrasse 2 percula clowns (tank raised) 1 lyretail Anthias 1 longnose hawk All aprox 1 inch in size with exception of the lyretail, almost 2 inches. 3 starfish all caught in the Keys. I have never actually Identified them, they are bumpy and a gold/brown color I have had them for over two years. And a few very small blue legged hermit crabs. My tank is a 45 gal tall with 2 of the largest Emperors (forgive me). I have never invested in a wet/dry but to be honest I have done very well with the system I have. >>Emperor FILTERS (better clarify for readers), not Emperor angels! This is a perfectly good filter, and if it works, well then, hey. However, this size tank is a little on the small size for most all anemones that Clownfishes host. 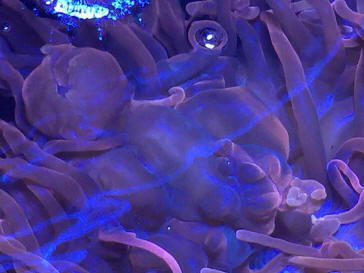 I will highly recommend that you go with the bubble tip anemone - they're being "bred" (asexually) in captivity, have pretty darn good survival rates, but can (and do) become rather large. Also, don't mix anemones (mobile invertebrates) with sessile invertebrates. >Water quality has always been good. Have it checked when I do my water changes, which can vary. but I usually do them every other month. >>You'll likely need to be a bit more stringent with this schedule when you acquire another anemone. Know also - hobbyists and fish shops simply cannot test for all that affects the quality of water. 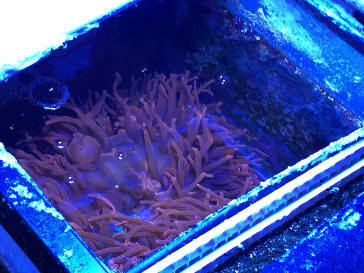 >I am going to do a small (10%)water change today, the anemone left some undesirable debris behind. >>Personally, I'd do a minimum 30% water change, even if the remaining inhabitants appear healthy. Dead anemones really do a number on water quality. >I think my biggest mistake was not checking into the anemone that I bought first. Like so many saltwater aquarist I get impulsive....bad move I know. >>Lessons learned, yeah? >Again, thank you for your timely response and your good advice. Do you ever go home?? Have a nice day. KJ >>I "work" from home, remember, we're an all-volunteer service. Pretty neat, I'm sitting here looking at my snowy back yard with a cup of coffee. 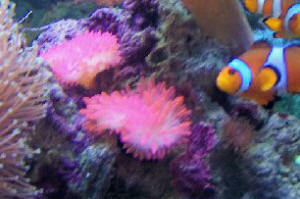 Take care, and do that research on the anemones, look into the BTA I suggest. Marina P.S. Remember to learn about acclimation procedures for invertebrates!